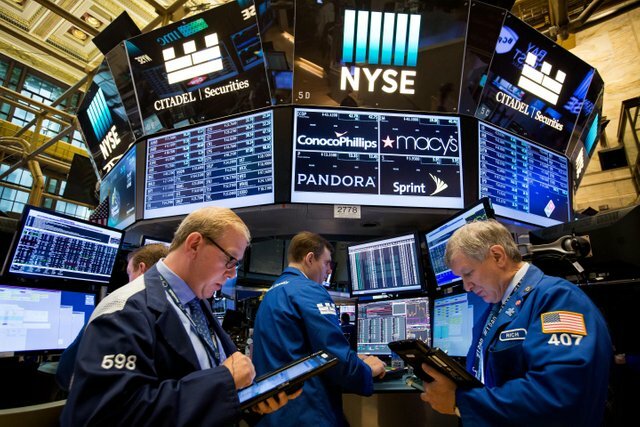 US stocks ended the green session's latest trading session this week on green as record highs for both the Dow Jones Industrial Average and the S & P 500 as well as Nasdaq Composite as technology shares led gains rallies as Apple shares hit a new record amid demand strength. Its all-new iPhoneX product and optimism about sales of the US high-tech giant on the eve of the US holiday season.We have followed the US economy disclosure of labor market data for October, which showed a decline in unemployment rates to 4.1% to see the lowest levels since the beginning of 2001 compared to the previous September and expectations at 4.2%, while the average income per hour Stability at zero versus 0.5% growth in September, contrary to expectations of slowing growth to 0.2%. we also followed the world's largest economy by reading the Non-Farm Sector Change Index last month, which showed job creation accelerated to 261,000 versus 18,000 jobs added in September, below expectations of about 312,000 jobs added , In line with a reading of the balance of trade deficit widened more than expected to $ 43.5 billion against $ 42.8 billion in August.This came ahead of the release of the PMI reading, which is important in that the US service sector accounts for more than two thirds of the US GDP, which has expanded to 60.1, showing the index's best performance since August of 2015 compared to 59.8 in September, September, higher than expectations at 58.5, in conjunction with a factory demand reading that accelerated more than expected in September.This comes hours after unveiling the tax reform plans adopted by the Republican Party of President Donald Trump, which could lead to doubling the size of the basic cut and the imposition of credit tax on US households to $ 1,600 with the division of tax rates to 12%, 25%, 35% in addition to To 39.6%, with the 39.6% start-up of $ 1 million for married couples, double the previous figure of $ 470,000.The tax reduction on mortgages for existing loans and new purchases up to $ 500 thousand and retention of 401A Retirement Plan and Individual Retirement Plan (IRA) will continue, with the possibility of changing the minimum tax limit and doubling the tax exemptions that may be permanently canceled. Within six years, with the corporate tax cut from 35% to 20% and the cancellation of the interest on loans to small businesses, while a tax will be imposed on the university curriculum and the abolition of the tax on government / local property for $ 10 thousand.Other than that, we also followed on Thursday the announcement by US President Trump that Federal Open Market Committee member Jerome Powell was his candidate for governor of the Federal Reserve. whose term expires in February, The American Senate.After choosing Trump to take charge of the Federal Reserve until February 2022, Powell noted that the banking system is more stable than ever and that the Fed will remain committed to monetary policy objectives - stabilizing inflation at 2% and achieving employment levels And that the Fed's decisions will remain fully independent, adding that the economy has been able to make sustainable progress.The Dow Jones Industrial Average closed 0.10% higher at 22.93 points at 23,539.19 points. The S & P 500 rose 0.31% or 7.99 points to close at 2,587.84 points, while the Nasdaq Composite Index gained 0.74% Or 49.49 points to close at 6,764.44 points.Gold futures for December delivery fell 0.59% to currently trade at $ 1,270.50 per ounce at $ 1,278.10 an ounce, while the US dollar index rose 0.23% to 94.91 compared to the opening at 94.69.On the other hand, NYMEX crude futures for December delivery rose 2.09% to currently trade at $ 55.68 per barrel compared to the opening at $ 54.54 per barrel. Brent crude futures for January 15 delivery Up 2.47% currently trading at $ 62.12 per barrel compared to the opening price of $ 61.62 per barrel. The @OriginalWorks bot has determined this post by @ahmadelhussein to be original material and upvoted(1.5%) it!